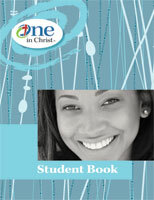 Grade 8 materials consist of 100 lessons that present a sequential Bible survey of the Old and New Testaments. Each lesson is designed to be taught in 35–45 minutes. One in Christ Grade 8 teaching materials are arranged in nine units, each with its own theme, worship suggestions, bulletin board, and mission story. Each lesson contains a lesson plan with background information, a classroom devotion, the main theme, lesson objectives, Law & Gospel points, and a materials listing. Grade 8 Student Book. This colorful discussion guide has two pages per lesson. Activities include study of God’s Word, daily activities, memory verses, and life-application stories that give students an opportunity to reflect and respond to the lesson. Grade 8 Student Book. This colorful discussion guide has two pages per lesson. Activities include study of God’s Word, daily activities, memory verses and life-application stories that give students an opportunity to reflect and respond to the lesson. Faith Alive Student Bible—ESV Translation.